More people and jobs, more subway and bike trips. Note that the subway and bus ridership numbers are annual figures. Graphic adapted from NYC DOT’s Mobility Report. With New York City’s population swelling to a record size, subways and bikes now account for about 700,000 more trips each day than 16 years ago, according to a new report from NYC DOT [PDF]. Car trips into the Manhattan core, meanwhile, are declining, but so is citywide bus ridership. 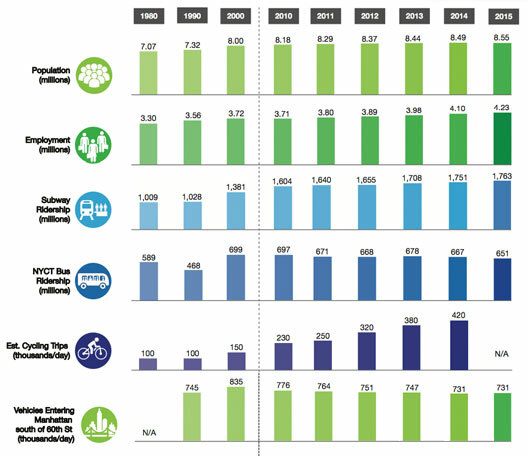 DOT’s “New York City Mobility Report” follows in the footsteps of the Bloomberg-era “Sustainable Streets Index” — an annual update on city transportation trends. After skipping two years, DOT is out with its first edition of the report under Commissioner Polly Trottenberg, adding some interesting data. The stats are a testament to the importance of transit and bicycling to New York’s ability to welcome more people and sustain more economic activity. They’re also sobering. What happens if the subways and streets can no longer keep up with the city’s growth? And why are New Yorkers abandoning the bus? The subways are, by and large, beyond the city’s control. But NYC DOT does control the streets, and while the Mobility Report isn’t prescriptive, if you read between the lines the implications are pretty clear. Using location data from Citi Bike and yellow taxis, DOT reports that it is now faster to bike in Midtown Manhattan than to drive. Bike-share trips that start and end in Midtown are at least 2 mph faster than comparable cab trips between 8 a.m. and 6 p.m. The city may not be able to enact a congestion-busting plan like Move NY on its own, but it can help people beat car congestion by providing safe routes for bicycling. The red zones are where bus routes are most in need of a speed boost. 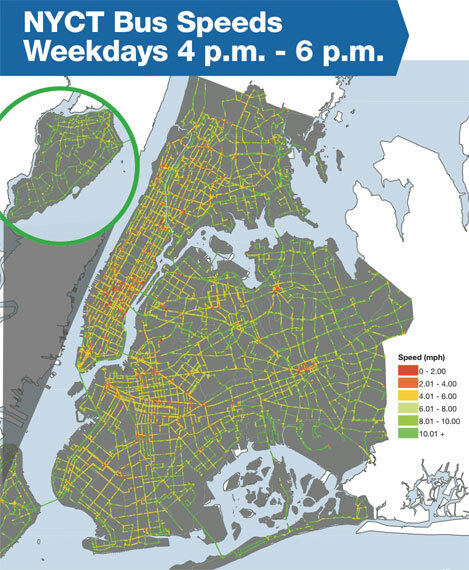 In addition to steps like off-board fare collection and bus lanes that DOT and the MTA are rolling out route-by-route, the map suggests that on-street parking reform could have a significant impact on bus speeds. As DOT notes, bus routes are “slowest in commercial districts like Midtown Manhattan, Downtown Brooklyn, and Jamaica Queens.” Many of those districts are where parking placard abuse is most rampant or meters are most underpriced relative to demand, so buses get by slowed down by double-parked cars and motorists circling for cheap spots to park. No progress has been made on the placard front or the pricing front in years. The trend in bus ridership suggests the city and the MTA need to ramp up their efforts to improve service. Five years after a major round of service cuts, New Yorkers continue to make fewer bus trips. Bus ridership fell 2 percent in 2015 compared to the previous year, and has dropped nearly 7 percent since 2010. In that five-year span, citywide bus speeds have fallen 2 percent. From 2010 to 2015, the number of car registrations in the city rose by 112,000, but the population-adjusted car ownership rate held steady at .22 cars per person. Truck traffic is rising as the city grows, with freight trips increasing 5.7 percent from 2010 to 2013. Streetsblog recently spoke to DOT Deputy Commissioner Ryan Russo about the report and what it tells us. Stay tuned for highlights from the interview. As I’ve said, NYC should take over its bus and paratransit system as a way of increasing funding for the MTA and improving management. The long term trend in bus ridership should be thought of this way. Between 1990 and 2000, Metrocards with free transfers and unlimited rides were introduced. This made the cost of a bus ride for those also taking the subway zero. And as a result, people who otherwise would have walked (or perhaps biked) started taking buses. At the time, I recall a quote that the free transfers were seen as a way to “save the bus system.” Since then, the long term decrease in bus ridership has resumed. And the speeds are the reason. I’ve had occasion to spend some time in Chicago recently. There more people ride the bus than the subway, and the reason is the buses MOVE. The figure from the report that compares taxi rides vs Citi Bike rides within the midtown core is interesting. Almost all of these trips are under 2 miles long, and most are under 1 mile. Despite Citi Bike being both cheaper and faster, and not much of an exertion for such short distances, taxi rides outnumber it 10 to 1. While I don’t expect every taxi passenger to switch to Citi Bike, I think this reveals how huge the room for expansion is within the midtown core. If number of stations and bikes were increased significantly and the casual use of bikeshare made easier, the taxi-to-bike ratio would become much smaller. Unless we get a comprehensive Dutch-style network of protected bike lanes, that’s not going to happen. Why? Because traffic violence scares the $&^#!! out of people. We already have more than enough “fearless” users to run out of Citi Bikes in midtown extremely quickly. I think it’s a bit of a chicken and egg thing. If you increase the number of Citi bikes running around midtown let’s say fivefold, it becomes much easier to justify building better infrastructure. I also think Citi BIke needs to communicate better how safe it really is (maybe their lawyers won’t let them?) The other day a coworker said “I wonder how many people have been killed on Citi Bikes”. When I told him the answer is zero he was *extremely* surprised. I didn’t think to ask him for a guess first, but based on his tone I think he would have put it in the double digits at least. I wonder if one reason cars in midtown are fewer but traffic is just as slow is because of the explosion of massive construction projects. I hardly take a single trip in midtown where I don’t bike around a mini-traffic jam because a big truck or machine is blocking a lane, or being dropped off, or some kind of construction-related obstruction. Not to mention the entire lanes of traffic on some crosstown streets that will be or have been closed for years. Dude. Please just focus on improving your defense. You were atrocious in that first game against the Warriors. We can’t even get good infrastructure where people cycling are a veritable swarm of thousands per day, such as Jay Street in Brooklyn, so the idea that we have to get people cycling in advance of the infrastructure has been tried and failed. Maybe you are right and I’m too optimistic. In any case, I still think the demand for Citi Bike in midtown far exceeds supply, even in the absence of good infrastructure. The bus is too damn slow. In too many cases it’s competitive to just walk. I visit Chicago a lot (most of my extended family live there). Some buses in Chicago “MOVE,” others … don’t. My experience is that if you’re going up or down along the lake, there are lots of relatively fast buses with few stops, making it a very practical means of transport. If you’re going crosstown (east-west), the buses all seem to stop every 5 meters and as a result, are slow as molasses. I find this to be the case even where I live. The bus to downtown Flushing takes at least 15 minutes once it comes, but typically the wait is 15 to 20 minutes. I can walk the 3 miles in maybe 5 minutes more than the bus will typically take if you include waiting time. Totally not worth paying a fare just to save 5 minutes. In Manhattan where trips are usually shorter, and the buses often average less than walking speed when they do come, I see taking the bus as pretty pointless. I see taking the bus as pretty pointless. For those with limited mobility or considering weather etc…that’s going a bit far. But the decline in bus ridership in Manhattan has been much larger than in the outer boros for what that’s worth. I had a similar conversation with a friend and his Dad that wondered if I thought it was dangerous to bike in NYC. I told them that it was safer than being a pedestrian, because you’re a bigger object, going parallel with vehicles rather than perpendicular (vs. pedestrians crossing in front of cars), with blinking lights, and I wear a helmet and reflective gear that pedestrians don’t. Later I also find out I was also statistically correct. I will speculate that at least 20% of these short taxi trips will be replaced by cycling by Sept. 2017. It’s not just CitiBikes, it’s all bike shares across North America. Thus far, I have only heard of one incident of a bike share user being killed anywhere in North America, a guy who was biking drunk on a Chicago highway at night. Bike share is pretty safe. I wouldn’t go as far as to say that cycling is safer than walking. Sure, statistically you see about ten times as many pedestrians vs cyclists killed in a given year, but you have to keep in mind that walking trips outnumber cycling trips by more than ten to one. The same is probably true of walking distance vs cycling distance. The actual figures in the US are 1 cycling death per 16 million miles and 1 pedestrian death per 70 million miles. The cycling number would improve considerably with better infrastructure and more people riding. As a guideline, in the Netherlands the numbers are about 5 times better than in the US, which would put them on par with walking. Yeah but that will always be a small share of the population or a small part of time and will not draw mass ridership. Plus those with limited mobility can slow the bus down even more since even on SBS level-boarding has been rendered an impossibility by the dozen or so apparently undefeatable and unchangeable bolts holding the front-right wheel on. I’m sorry to tell you but cycling in NYC is significantly more dangerous than walking in NYC. Normalize the number of deaths and injuries by mode share and you’ll see what I mean. Savvy post , I was enlightened by the details , Does someone know if my assistant can get ahold of a fillable a form copy to fill in ?